Hearing aids can help with a variety of types and degrees of hearing loss. She notes that there is a limit to who is a candidate for a hearing aid, since a hearing test must show some measurable hearing. It’s still important to protect your ears by avoiding loud noises at concerts, in factories, and other noisy environments, and using hearing protection when it’s not possible to avoid these situations. No hearing aid will ever be as good as our own healthy and complex hearing ears! But if a person needs a hearing aid, technology has never been smaller and more efficient, and it continues to improve all the time! Dr. Raphael took time to answer all our questions about advancements in hearing aid technology and choosing the right hearing aid for your needs. 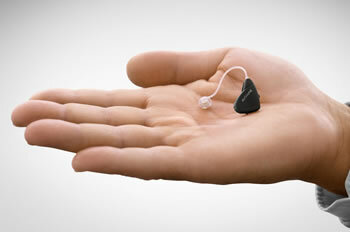 Hearing aids have entered the digital age. What are the newest developments? Hearing aids have gone from all analog to nearly all digital over the past decade. This has allowed tremendous advancements in speed and accuracy in signal processing, the main advantage being better processing of speech in the presence of background noise. Can you talk about developments in wireless hearing aids, streaming audio to hearing aids from mobile devices and the like? As far as wireless technology goes, not only can we program the hearing aids without the use of annoying, dangling hard wires to the patient’s ears, but more importantly, wireless technology helps patients overcome difficult listening environments. For example, a miniature microphone (or companion mic) can pick up a friend’s voice and transmit it directly to a patient’s hearing aids, cutting through whatever background noise or distance may be interfering. A phone clip accessory paired to a person’s wireless aids can transmit the cell phone conversation clearly and “hands-free” direct to the hearing aids. A remote control paired to the hearing aids allows wireless adjustments to volume and program settings. What are ear-to-ear technologies and how do they help people to hear through hearing aids? Some newer digital hearing aids can communicate with each other from left ear to right ear and vice versa, rather than standing alone and working independently. This improves hearing in noisy situations. The hearing aids constantly scan the environment and determine where speech and/or noise may be coming from, and can automatically change the microphone polar patterns (both omni, both directional, or omni/directional split) to allow for optimal hearing of speech amidst noise. Another advantage of hearing aids that communicate with one another is that a change in volume or program on one side results in a change in both aids. In terms of audio quality, how much has hearing aid technology advanced in the past 10 years? When I first entered the audiology profession 25 years ago, we were fitting analog hearing aids, forced to use a screwdriver on the tone pots to make any changes in frequency response, and those changes were very limited. Now we program digital hearing aids through the use of a computer, with nearly infinite changes possible to every aspect of the hearing aid. Dramatic changes are possible). The processing of speech in noise has dramatically improved, as has the digital feedback suppression, meaning that hearing aids today are much less likely to whistle. For someone looking into hearing aids, what are the different types available they can consider? Many styles, sizes, and colors are available in hearing aids. A popular newer style is the RIC (receiver in the canal) miniature behind-the- ear aid, with a clear thin plastic tube running from the ear to the hearing aid, so you barely notice the hearing aid. Many custom styles also exist from full shell down to tiny completely in the canal aids, which are nearly invisible. See Leading Hearing Aid Manufactures. What factors would influence someone’s choices, in addition to their doctor’s recommendation, of course? The technology level (and price) are best determined by a person’s lifestyle: The more active, social, and time spent in challenging crowds/noise, the more sophisticated the hearing aid needs to be. Dexterity is also considered in selecting the proper hearing aids. Unfortunately, since most hearing aids are not covered by insurance, budget is a big determining factor in hearing aid selection. Many people who need hearing aids cannot afford them. On a more positive note, many hearing aids can be “demo’d” in the office, and once purchased to take home, come with a money-back trial period, and free adjustments. What other developments or discoveries do you see on the horizon to treat deafness? Hopefully, one day in the future, scientists will have a “cure” for hearing loss and tinnitus (ringing in the ears). They are always looking for ways to regenerate hair cells in the cochlea of a damaged ear, but to date, have not been able to regrow hair cells in humans.